Enhanced, more vivid color spectrum with new 4 Red LEDs with wide angle lenses, 52 Blue LEDs and 56 white LEDs. User Replaceable LED Modular Boards, just use a screwdriver. DUAL DIMMERS one dimmer for Blue LEDs, one dimmer for White LEDs 35% larger light spread compared to Ecoray 112D All Clear lenses Independent LED circuit design. If a single LED fails, it wont affect any other LEDs. Easy Access to LEDs through removable glass cover Bridgelux LED chips. New, specially designed lenses provide the best combination of high PAR and light spread. For a 24 deep tank, use one Ecoray 112DX for approximately 30 x 20 area to provide 150+ PAR at 24 around the perimeter of the 30 x 20 area, increasing to 500+ PAR toward the center. For larger coverage, place it higher above the water level. Deeper tanks will automatically get larger coverage. 150+ PAR is generally considered to be the minimum lighting requirement for LPS corals while clams and SPS corals generally require 300+ PAR. Do not be confused with many low PAR LED units in the market claiming large coverage area for similar or higher wattage, these units generally produce only 40-100 PAR at 24 from center (one twelveth to one fifth the PAR of Ecoray 112DX). These low PAR LED units do not provide adequate lighting intensity and they are not suitable for reef aquariums with LPS and SPS corals. 250+ PAR at 24 from center with only Blue LEDs on Turn on the Blue LEDs only and watch the intense colors of your corals. The 112 1 watt LEDs combined are brighter and more efficient than 37 3 watt LEDs, with much lower heat. Check out this article by Dr. Sanjay Joshi comparing light intensity and distribution of Ecoray 112D against other LED manufacturers Cooler operation With 1 Watt LEDs, an aluminum PCB, a thick aluminum base plate that serves as heat sink and super quiet cooling fans, the Ecoray 112DX produces an LED junction temperature of only 56 °C (133 °F), far lower than the 88 °C (190 °F) allowable maximum. Modular design Fits most reef tank sizes. For full coverage, place Ecoray 112DXs 6 to 7 inches apart. Get larger spread and wider separation by placing Ecoray 112DX higher above the water level. Install either the short or the long side facing the front. For example: -a tank 5 feet wide by 22 front to back width, 24 deep, would use 2 Ecoray 112DX with the long side facing the front. A tank 7 feet wide by 30 front to back width, 24 deep, would use 4 Ecoray 112DX with the short side facing the front. Save 50% energy Use at least 50% less energy than 250 W Metal Halide lights, while getting much higher intensity. Generally, replace one 250 W Metal Halide with one Ecoray 112DX to provide similar light spread. LEDs have life expectancy of up to 50,000 hours. Eliminate cooling costs Due to the intense heat generated by Metal Halide lighting, a separate cooling system is usually required that consumes additional energy and expense. All Aluminium Housing The high quality, corrosion-resistant, light weight, all aluminum housing is designed to last a long time over your reef aquarium. Most competitors models are made of painted steel which will corrode in 12 months or less. Completely Sealed Electronics PCB board, LEDs and all electronics are completely sealed to prevent moisture and air from entering the sealed area. Drivers are located outside the sealed area to allow for easy replacement, if necessary. Compact, Light Weight and Simple No separate, heavy ballast boxes or an on/off switch. Simply plug the Ecoray 112D into your timer, and then into an electrical outlet. Overall Color Temperature 25,000K 130 W, 110 V 240 V, Dual 12 ft electrical cords 2 Built-in fans All Aluminium Housing 22.2 x 13.4 x 2.6, 17 lbs Supporting L Brackets (not shown in photo) and hanging wire included. 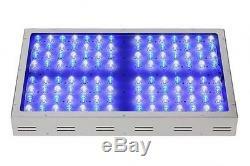 The item "ECORAY 112DX Version 2 LED Reef and Aquarium Light" is in sale since Tuesday, August 19, 2014. This item is in the category "Pet Supplies\Fish & Aquariums\Lighting & Bulbs". The seller is "vaquaticsllc" and is located in Chesapeake, Virginia.